This article is intended primarily to supplement my Whistle article. It shows how to make three different jigs to mount the whistle blank, while either round or still square, either centered or eccentric. All the jigs mount the axis of the blank parallel to the axis of the lathe. And all are intended to be used with tailstock support (if a cone center can’t support the work well a cup center may) but can be used without a tailstock using light cuts to trim off nubs. The jigs are not limited to whistles, of course, but can be used for any small project needing to be mounted in a parallel eccentric axis. First shown is how to make a sleeve from PVC pipe. This is useful for protecting already turned portions of the project from chuck jaws as well as bridging areas turned to less than full diameter. Next is how to make L-shaped spacer blocks which can used to mount the work eccentrically in either #1 jaws or pen jaws. Then shown is a sliding eccentric chuck designed to be used with two #2 tower jaws. Last shown is a sliding collet chuck, also designed to be used the two #2 tower jaws. A PVC sleeve, made from schedule 40 PVC pipe, can serve several purposes. It can protect already finished surfaces from chuck jaws. It can bridge over areas of the work that aren’t at full diameter if the jaws of the chuck being used are too short to do so. And it will extend the useful range for the sliding collet chuck. 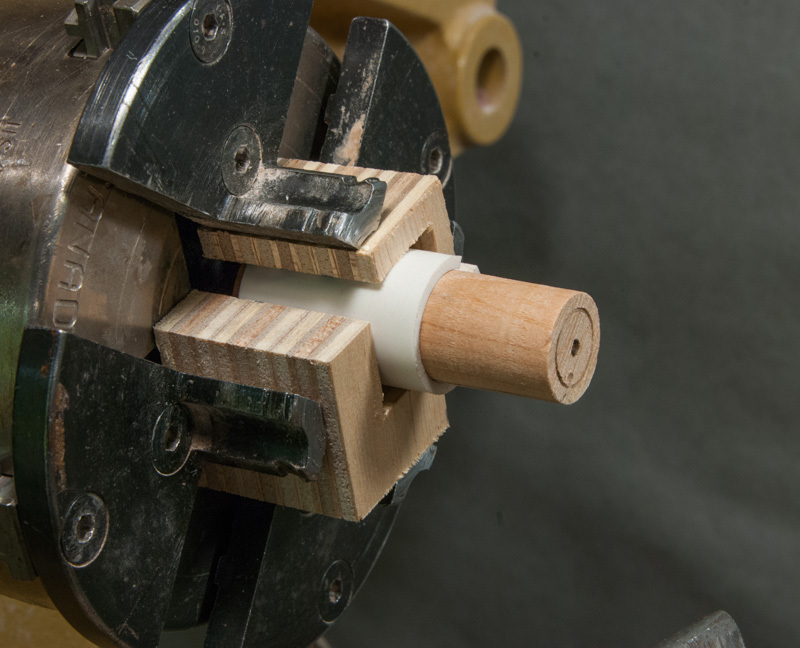 Begin by mounting a piece of wood in a chuck (I’m using #1 jaws in a 4-jawed chuck) and turn a tenon that matches the inside diameter of the PVC pipe. 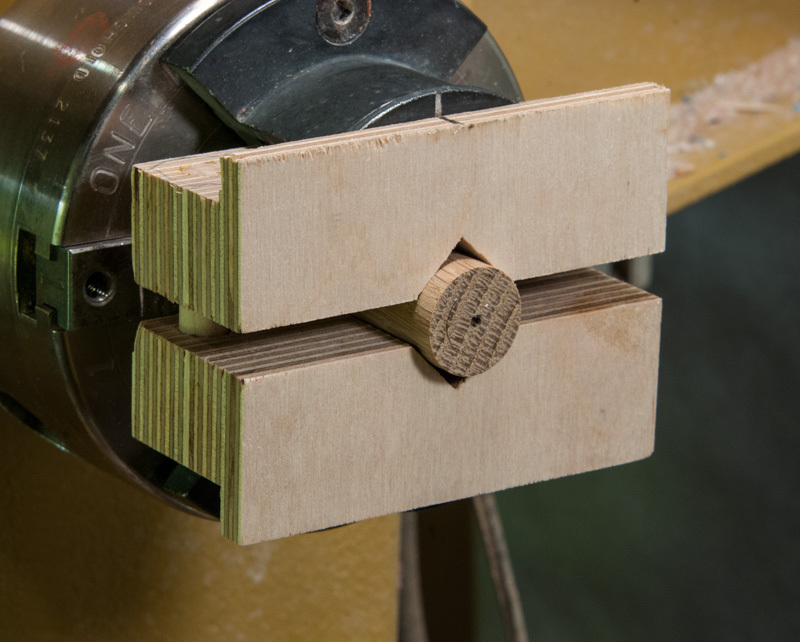 The tenon should be shorter than the finished length of the sleeve so that a large cone center can support the tailstock end without bottoming out on the tenon. Turning the shoulder of the tenon to the intended finished diameter of the sleeve would be convenient. Slide the PVC on to the tenon and bring up a large cone center to support the end. Square the end of the PVC with a thin parting tool far enough from the end that you don’t hit the cone center as in Figure #1. Then flip the PVC around and square the other end. 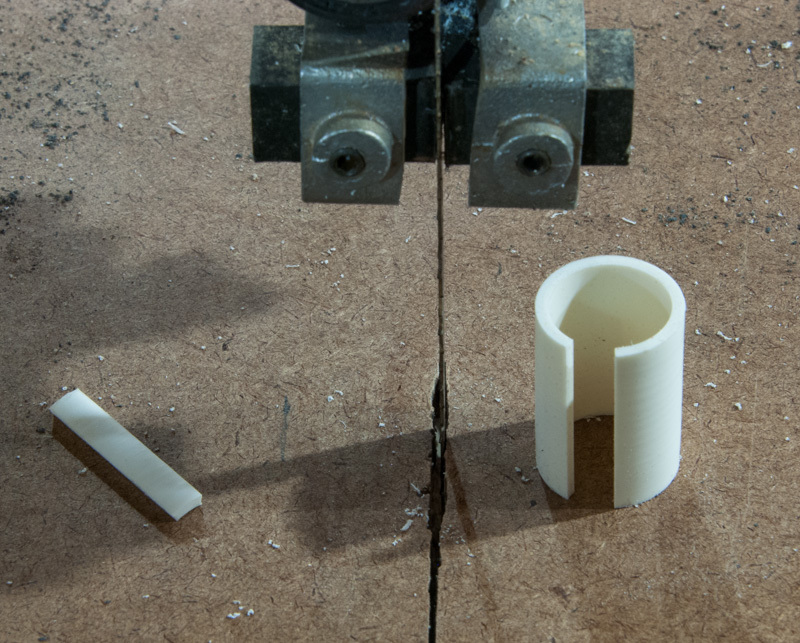 Figure #1: Square the end of the PVC pipe with a narrow parting tool. As it comes, schedule 40 pipe is a little thick for sleeve purposes and hard to expand or compress. So thin the walls of the PVC to make it easier to use as in Figure #2. As surface quality isn’t especially critical for this purpose you can use whatever tool you like. 3/32” is a reasonable wall thickness to aim for. You can check the thickness by backing off the tailstock cone center, by turning to a pre-set tenon shoulder, or by using calipers set to the inner diameter plus twice the intended wall thickness. 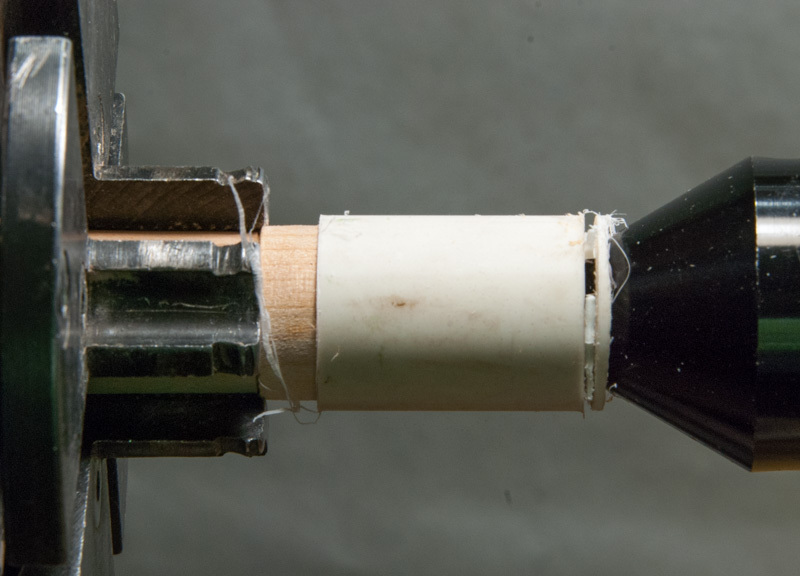 Figure #2: Thin the PVC wall thickness to reduce the force needed to expand or compress the sleeve. The sleeve must have a slot to be able to expand and contract. You can cut a slot on a sleeve of moderate length by standing it on end and cutting with a bandsaw as in Figure #3. If this doesn’t feel safe to you then clamp the sleeve lengthwise in a vise and use a handsaw such as a hacksaw. Try to size the slot so it’s fairly narrow at the intended diameter. Figure #3: Cut a slot in the sleeve. PVC thermo-sets so you can adjust the size of the sleeve if stock PVC tubing isn’t available in the size you need. To enlarge the sleeve, turn a plug that is the diameter of the inner diameter you want the sleeve to be. Bevel the end of the plug to make it easier to insert. Cut a single kerf slot in the sleeve blank. Then force the plug into the sleeve, then place it into a 200° to 250° oven for ten minutes or so. Remove the sleeve and allow it to cool, then remove the plug. 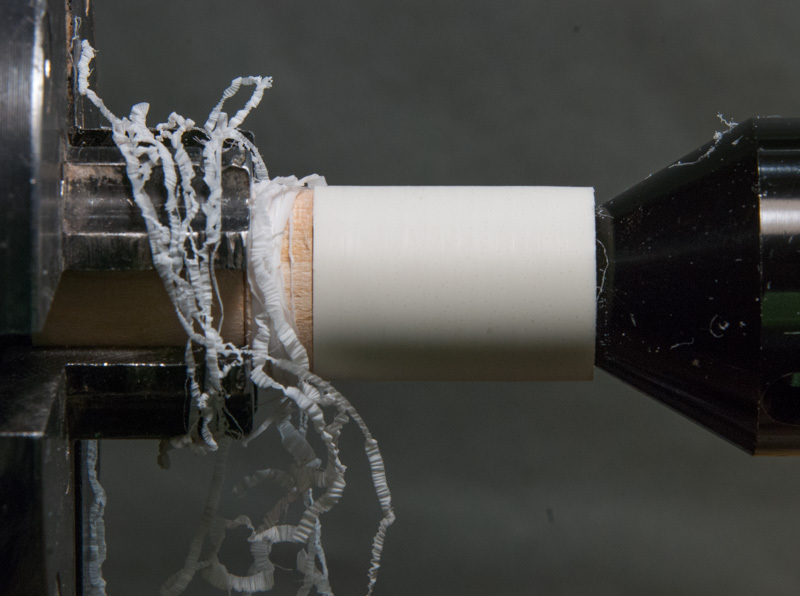 To reduce the size of the sleeve, do the math to calculate how wide of a slot to cut: (slot width) = π*((Diameter of PVC)-(Diameter of blank))+(a little extra). Also do the math to determine the intended outer diameter of the sleeve: (hole diameter)=(blank diameter)+ 2*(PVC wall thickness). Drill a hole of that diameter in a piece of scrap wood (I suggest plywood glued up to the needed thickness. The hole should perpendicular to the plies). Force the sleeve into the hole and place in a 200° to 250° oven for 10 minutes or so. Then allow the sleeve to cool and remove from the hole. 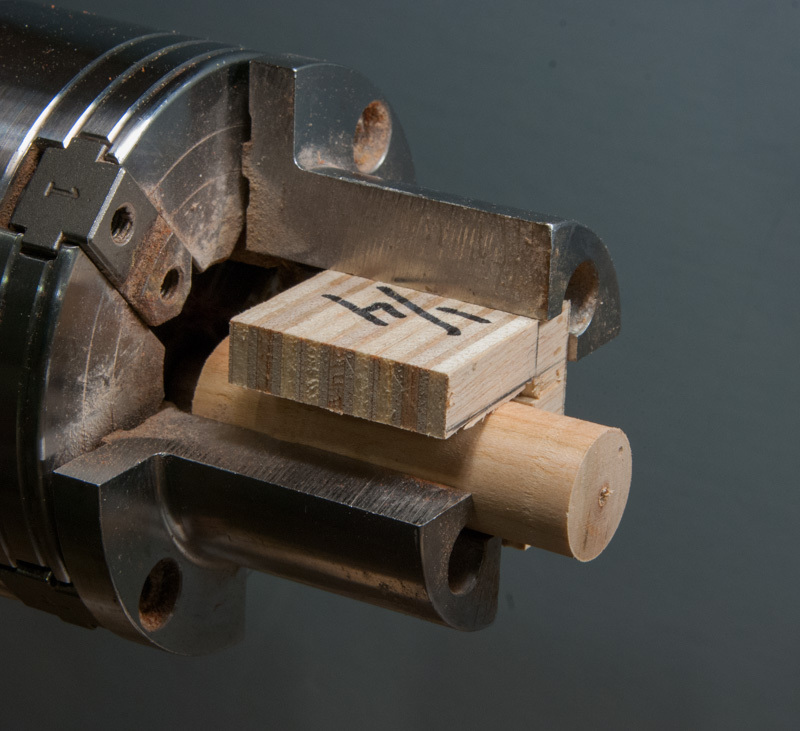 You can make L-blocks (which nest in an L-shaped chuck recess, such as pen jaws or between two #1 jaws) to move the axis off of the axis of the lathe. You can either guess how thick to make the sides of the L-block, do the math (if you do, don’t overlook the fact that the jaws have to be open wider to accommodate the block and the blank), or hope I did the math right (If d is the total displacement you want, and t the thickness of the L-block side you wish to calculate then t=1.4*d). 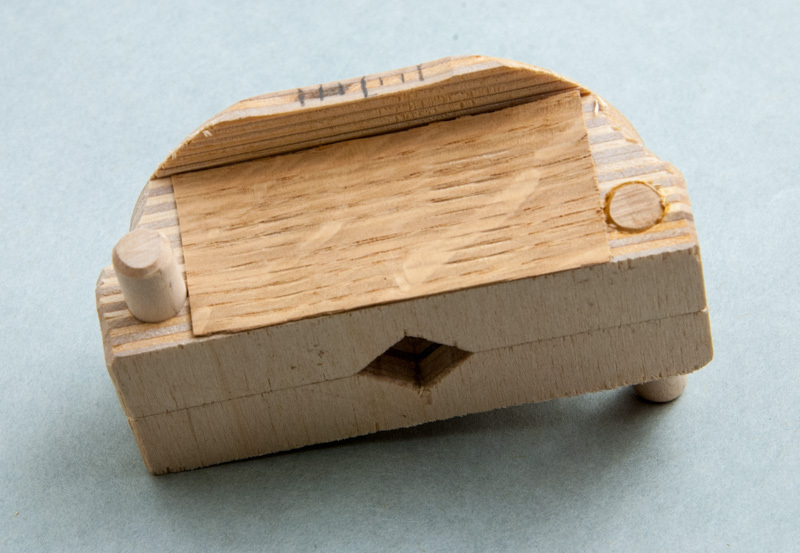 If you make the L-block out of solid wood there’s going to be some short grain somewhere regardless of how you orient it. So if you have a catch, rather than just ruining the project you’ll probably be peppered with exploding jig as well. Plywood is better, and Birch plywood is better yet as it’s stronger and void free. For strength the plies should be oriented so that the plane the plies lie in is perpendicular to the lathe axis. As 3/4” is pretty much too short for the jig so glue two pieces of 3/4” (nominal) plywood together. Use longer pieces than you think you’ll need (say 8”) to allow for mistakes. 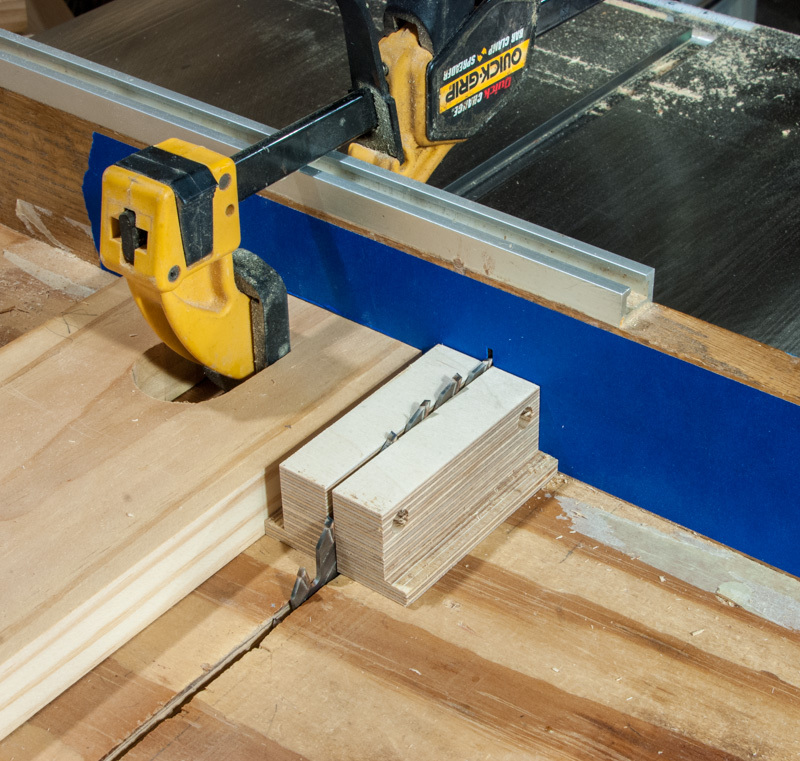 Longer pieces are safer to cut on the table saw as well. After the glue cures rip it to square on the table saw. Draw the L-block on the face of the plywood with one arm of the L extending to the end as in Figure #4. Allow a little extra thickness for trimming the sides exactly equal. To make it easier to see where you will cut apply some blue masking tape to the back and base of your table saw sled as in Figure #5. It won’t stay true long, but will last long enough to make a set of L-blocks. If you want it to last longer, tape cereal box cardboard to the sled—just use long enough pieces that the object you’re cutting doesn’t hang over the end of the cardboard. Tape will show the kerf nicely, but it won’t remind you line up the blank layout line on the correct side of the kerf. You’ll have to do that yourself. 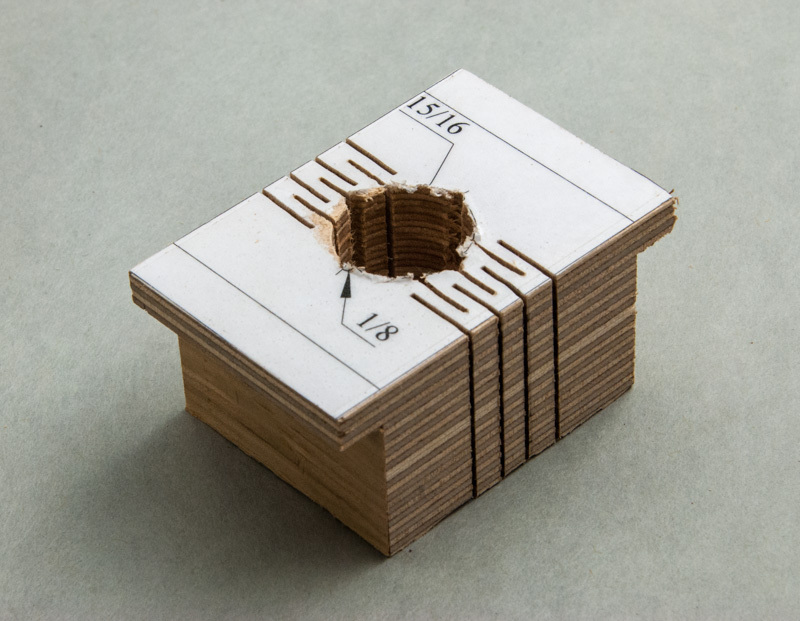 Figure #4: Layout the L-block on the face of the plywood. 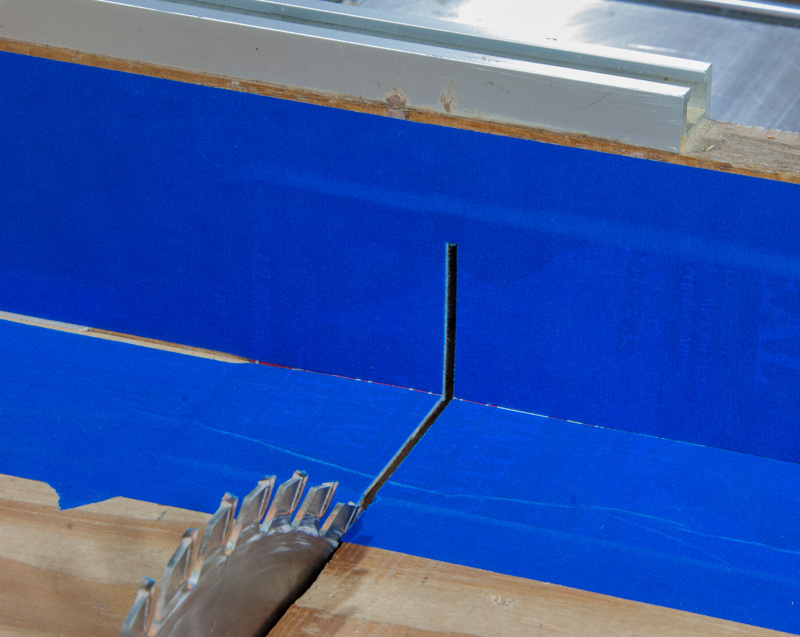 Figure #5: Tape over the table saw sled so you can see exactly where the kerf is. Set the plywood on the sled next to the blade and set the blade height to the inside length of the L. Place the plywood horizontally on the sled lined up for the first cut and bring up a stop block to that setting. Then make the first cut as in Figure #6. Then turn the blank around and place it vertically against the stop block (you could clamp it in place for more security) and make the second cut as in Figure #7. Figure #6: Make the inside cut for the first leg. Figure #7: Make the inside cut for the second leg. 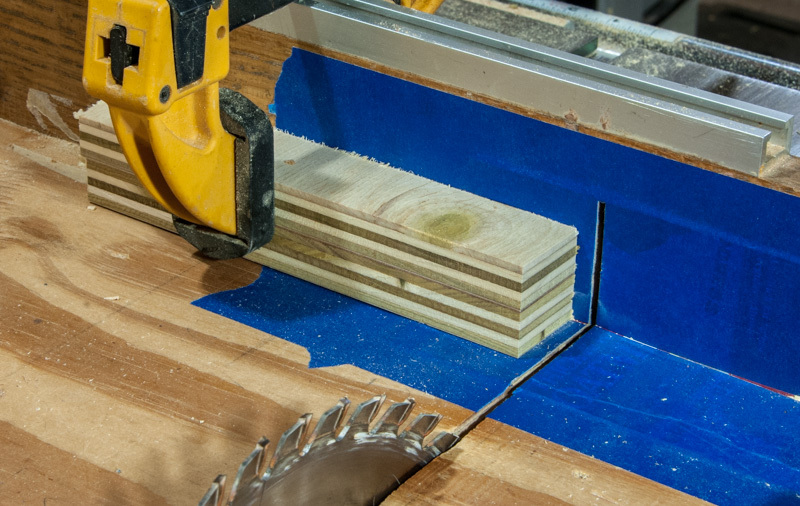 Move the stop block out of the way, raise the blade, and cut the L-block off of the plywood blank to complete the rough L-block as in Figure #8. Figure #8: Cut off the rough L-block. To trim the L-block more exactly make a trim blank. Find a piece of wood that’s 1-1/2” wide and at least a little thicker than the inside length of the L. Square the end if it isn’t already. You could use your plywood L-block blank as the trim blank, and at first glance at the picture it looks like that’s what I did, but it happens to be another glued up piece of lower quality poplar plywood. Place the trim blank on the sled so that the squared end is the exact width you want the L sides to be from the kerf and clamp it in place as in Figure #9. 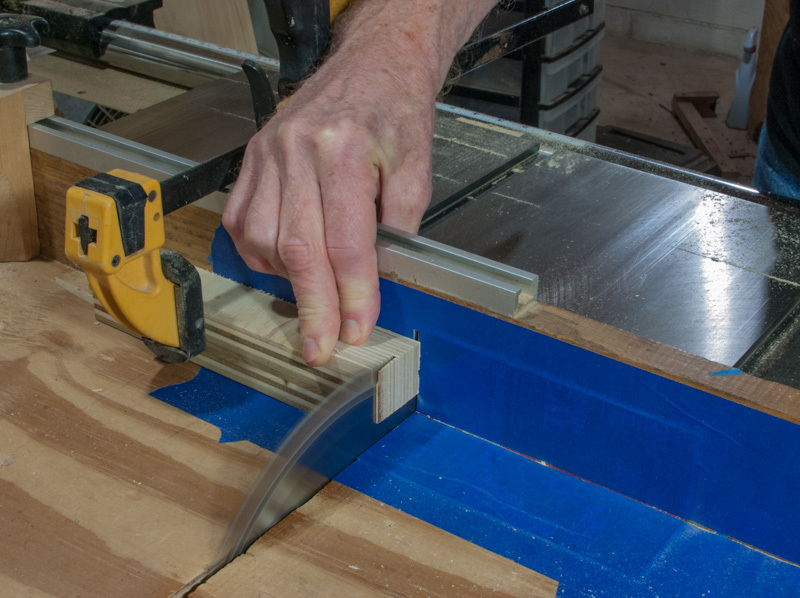 Figure #9: Clamp the trim blank in place so that it is as far from the kerf as you want the thickness of the L-block to be. Place the roughed out L-block on the trim blank with one leg hanging down with the inside of the L against the end of the trim blank. Raise the blade and cut the L-block leg to exact width as in Figure #10. If you don’t like your fingers that close to the blade then make a hold down by attaching a piece of 2mm craft foam to the narrow edge of scrap wood and press down with that instead as in Figure #11. Then cuts the other leg of the L-block the same way. Figure #10: Using a trim blank to cut the rough L-block to width. Figure #11: Using a trim blank and a hold down to cut the rough L-block to width. If you’re using the L-block with pen jaws then you’re done. If you’re using #1 jaws you may have to trim the L-block legs shorter on at least one L-blank to avoid them fouling on each other. You can trim the length on the table saw as in Figure #12, or just use a bandsaw as the cuts don’t have to be that accurate. Figure #13 shows a completed L-block. It’s a good idea to label the L-block size prominently so you don’t have to do the math again. 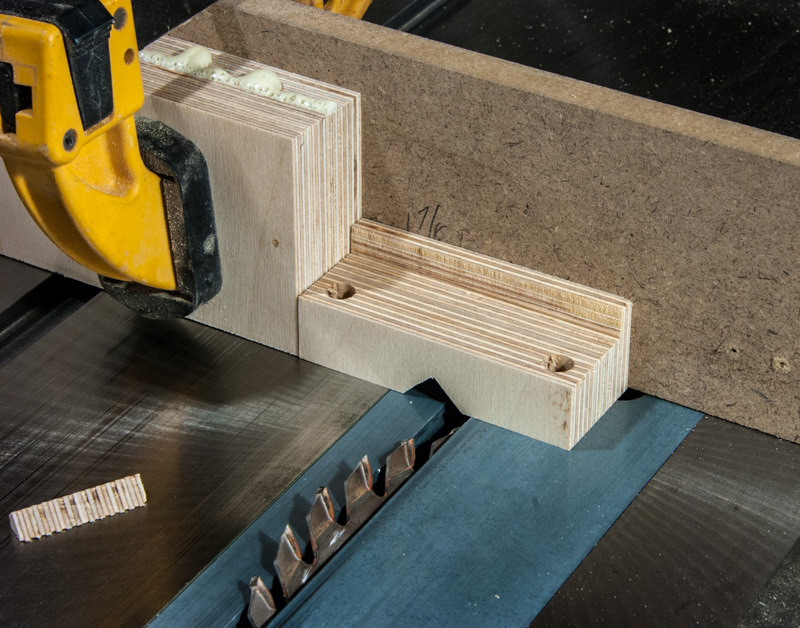 If you’ll be using pen jaws, a reasonable set of L-blocks to start with would be 1/8” and 1/4”. 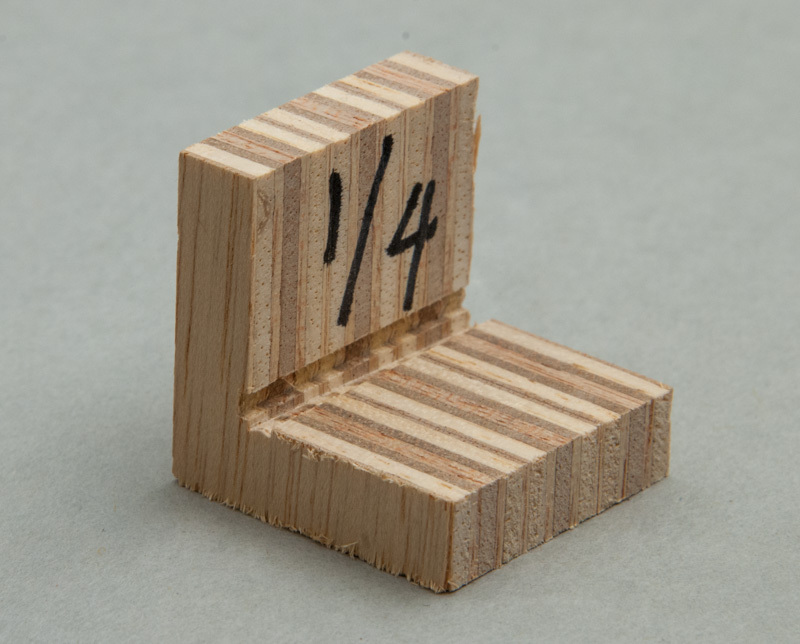 If you’ll be using #1 jaws, a reasonable set of L-blocks to start with would be two 1/8” L-blocks, plus a 1/4” and a 3/8”. Figure #12: Trim the length of the legs on at least one L-block for use with #1 jaws. Figure #13: The completed L-block. To use the L-block with pen blank jaws, just pick the size L-block you need, hold the project piece in it and clamp the pen jaws together as in Figure #14. If your project diameter is more than twice the inside length of the pen jaws then use a PVC sleeve to protect it from the edges. Either way, keep as much of the project in the jaws as possible and use tailstock center support as long as you can. 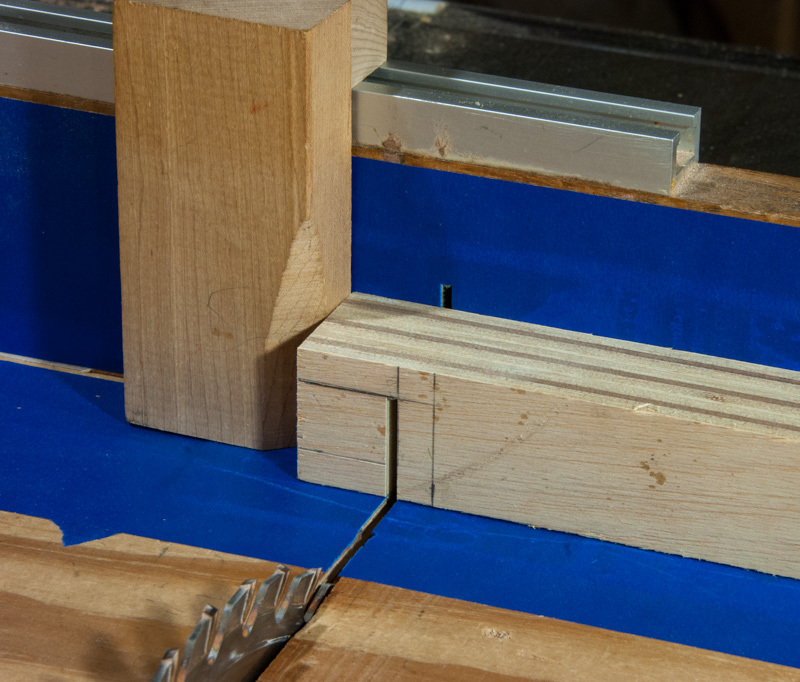 Figure #14: Using an L-block for eccentric mounting with pen jaws. You need two L-blocks to mount a project with #1 jaws as in Figure #15. To mount the piece on the lathe axis use two 1/8” jaws. To mount the piece 1/8” eccentric, use one 1/4” jaw and one 1/8” jaw. To mount the piece 1/4” eccentric use one 3/8” jaw and one 1/8” jaw. Again, limit the projection of the project to what you need to work on and use tailstock center support when possible. Figure #15: Using two L-blocks for eccentric mounting with #1 jaws. The sliding eccentric chuck is the most versatile option of this article. It will grip a wide range of sizes of either square or round stock, can be set to whatever eccentricity you want and it easy to tell where the maximum eccentricity is. However it has to be used with #2 tower jaws and is moderately fussy to make. Start by gluing up two layers of 3/4” (nominal) birch plywood. 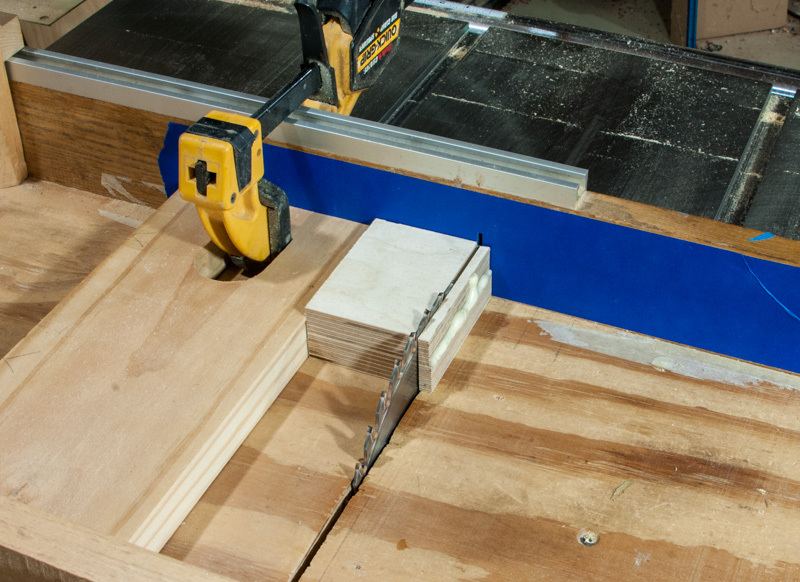 After the glue cures set the stop block of your table saw fence to 3-3/4” and cut the blank to length. 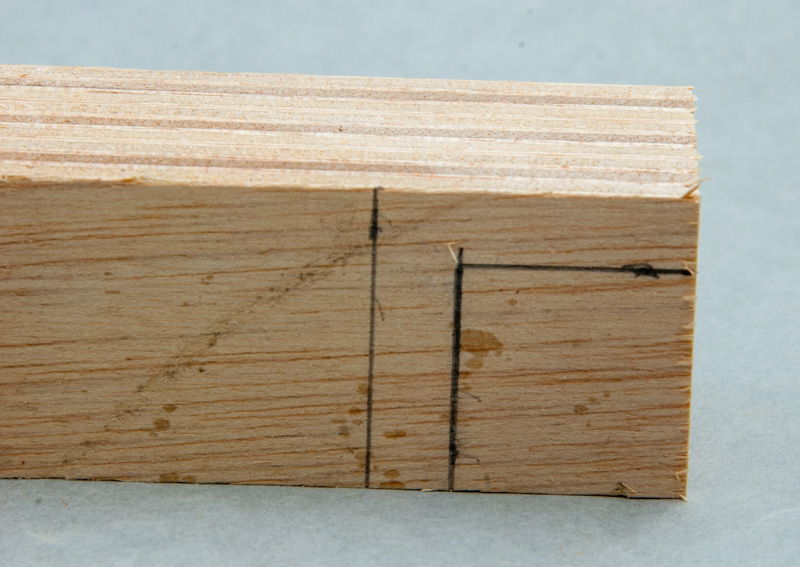 Before moving the stop block, cut several test pieces of wood to the exact same length as in Figure #16. These will be used as test pieces when cutting the V-notches in the chuck. They don’t have to be Baltic birch or even plywood, they just have to be the same exact length. 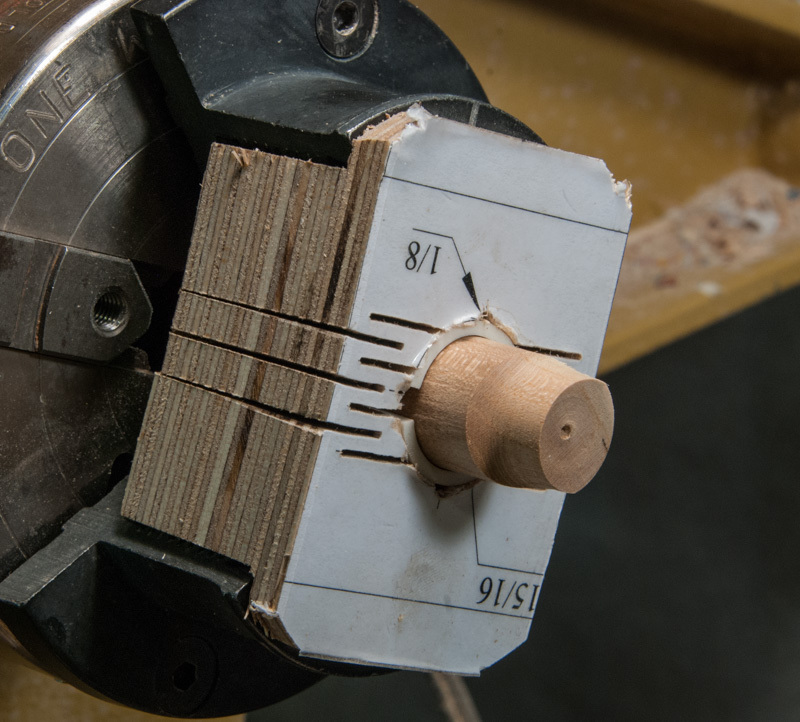 Figure #16: Cut the chuck blank and several test pieces to 3-3/4” length. Now cut the blank to a width of 2-5/8” as in Figure #17. 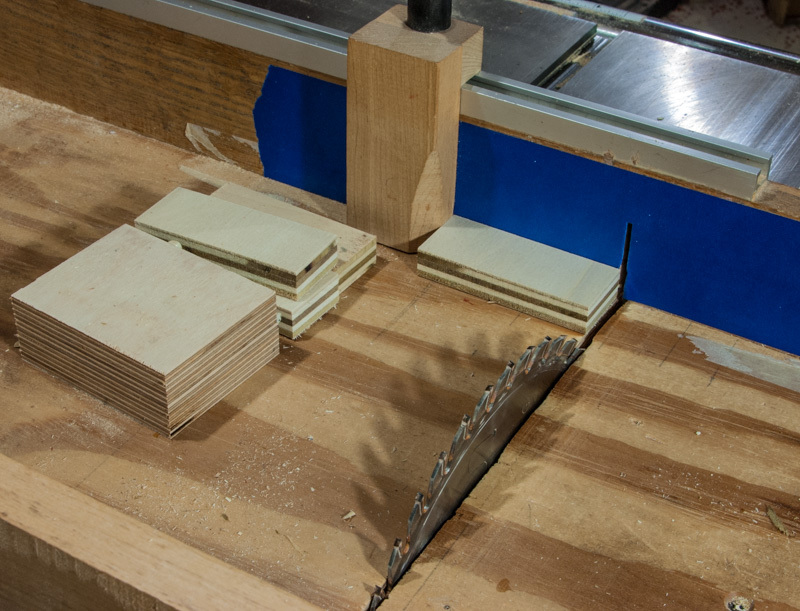 I like to cut small pieces, even when ripping, on my table saw sled. The fence I’m using in the photos is simple to make. Start with a board (I used 5/4 x 6 Radiata Pine) about 1/2” shorter than your table saw sled is wide. Bevel cut the back edge about 2°s so that clamping will force the fence down towards the sled. Cut a D shaped opening about an inch from the back edge that a clamp will fit into. Clamp the fence so that the left edge overhangs the kerf of the sled slightly and make a cut to ensure that the edge of the fence is parallel to the blade. Figure #17: Cut the blank to 2-5/8” width. Mark the blank for drilling the dowel holes. Set the blank so that it’s on one of the lengthwise sides. Measure over and in 3/8” from both back corners to mark for drilling. Find or make decent 3/8” dowels of maple or the like. Check what size hole they fit best in. 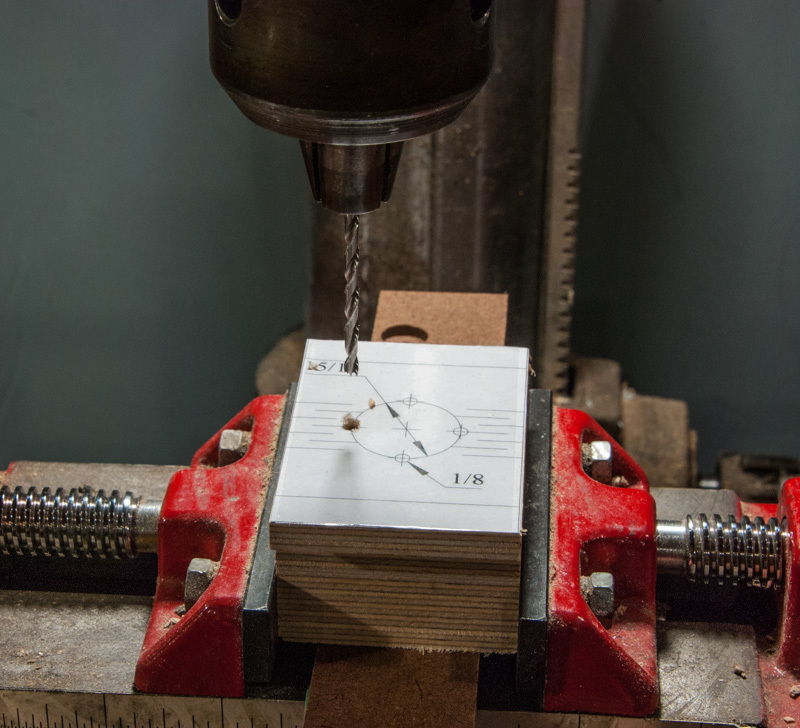 Clamp the blank on your drill press (The holes have to parallel to work properly. 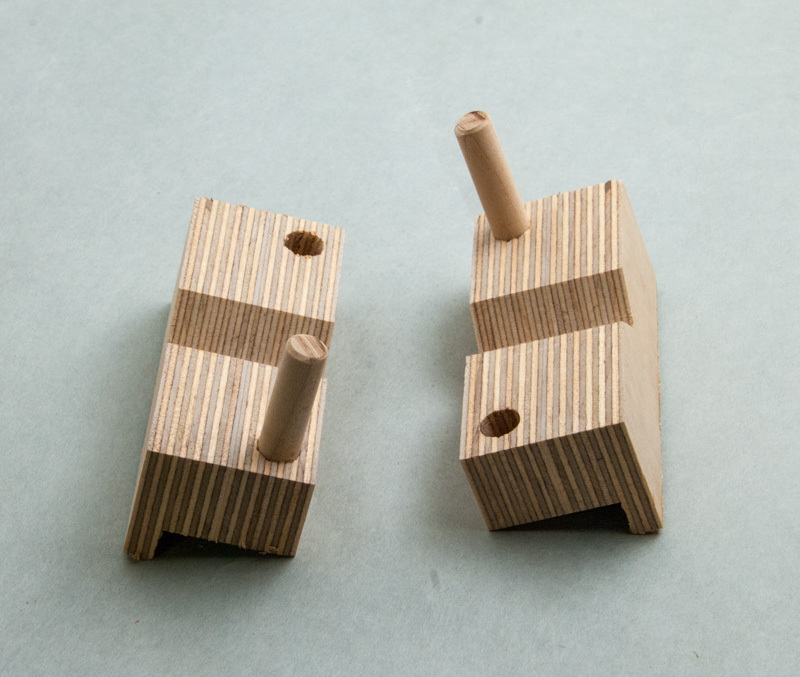 The dowels will bind in hand drilled holes) with waste wood underneath and drill at the marks with the drill selected as in Figure #18. The dowels will keep the jaws of the chuck together and aligned. Figure #18: Drill holes for aligning dowels. Adjust the blade height so that it’s just less than the height of your #2 tower jaws (mine are 1.26”). Adjust the fence so that the blade will cut a kerf 3/8” in from the side of the blank and make a cut on each side of the blank as in Figure #19. Then without changing the blade height make multiple cuts to remove the rest of the waste to form a rebate. You can work on the other side of the sled to do this or remove the fence or move the fence in increments. 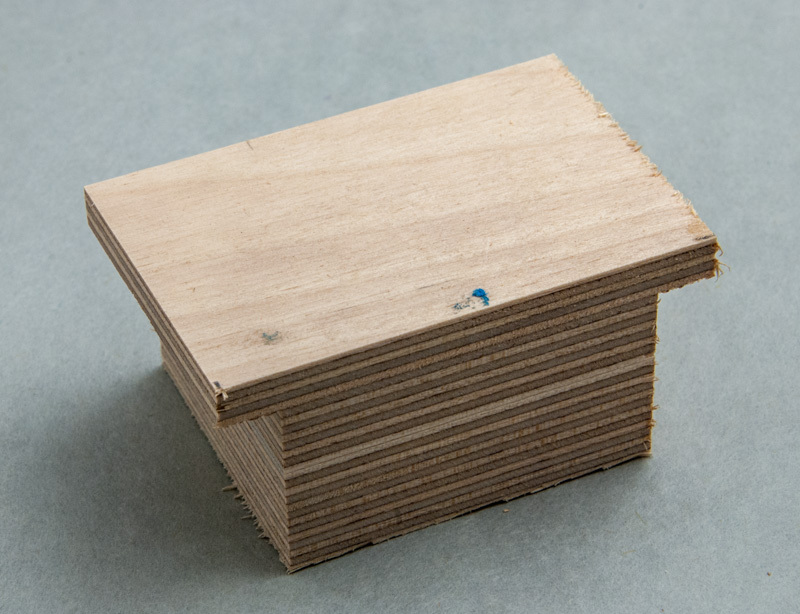 Figure #19: Cut a slot 3/8” (including the kerf) from each side of the blank. Mark the center of the blank after cutting the rebates. 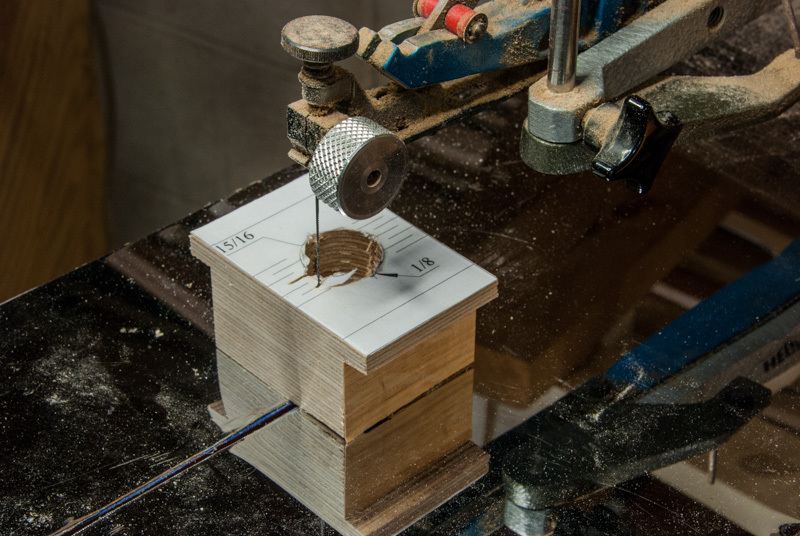 Align the fence so that this mark is centered in the kerf and rip the blank in half as in Figure #20. Figure #20: Rip the blank in half. Remove the table saw sled. 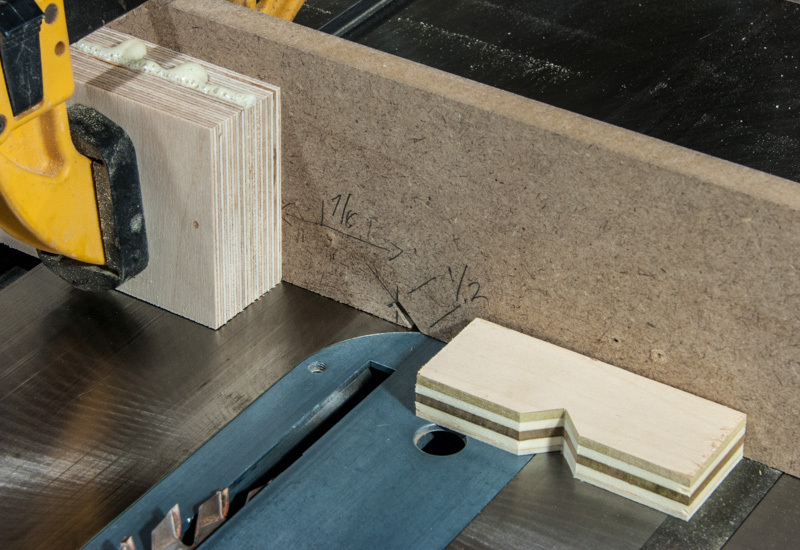 Mount a fresh face piece (so you can see your layout lines) on your miter gauge. Set the blade to 45°s. Lower the blade so that about 3/8” of blade is exposed and make a cut through the face piece. 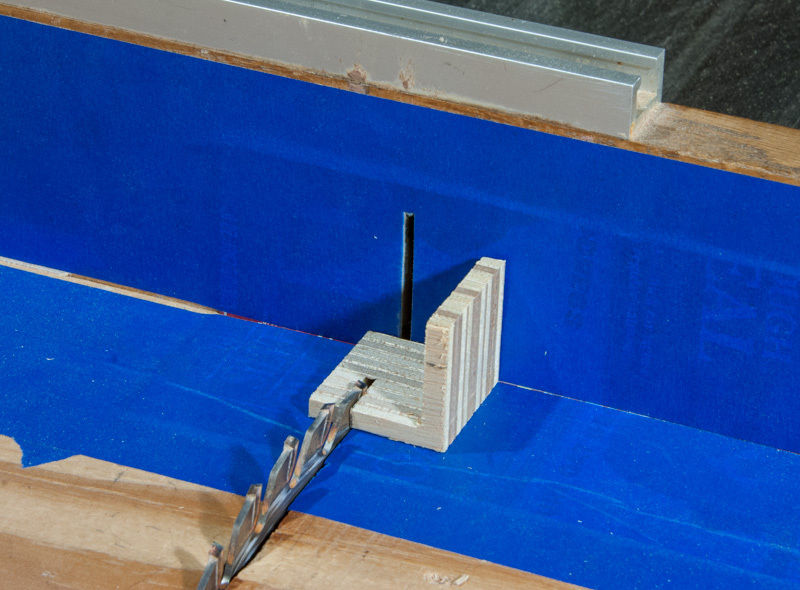 Remove the miter gauge and draw a 45° line extending along the higher side of the kerf. Measure 1/2” from the bottom of the face piece along the drawn line and make a mark. Now draw a perpendicular line from the 1/2” mark to the bottom of the face piece. Measure 1-7/8” from the perpendicular line and draw a line. Replace the miter gauge. Figure #21 shows the face piece to this point. Now make multiple passes through the blade, increasing the height slightly each time, until the kerf reaches the 1/2” mark. 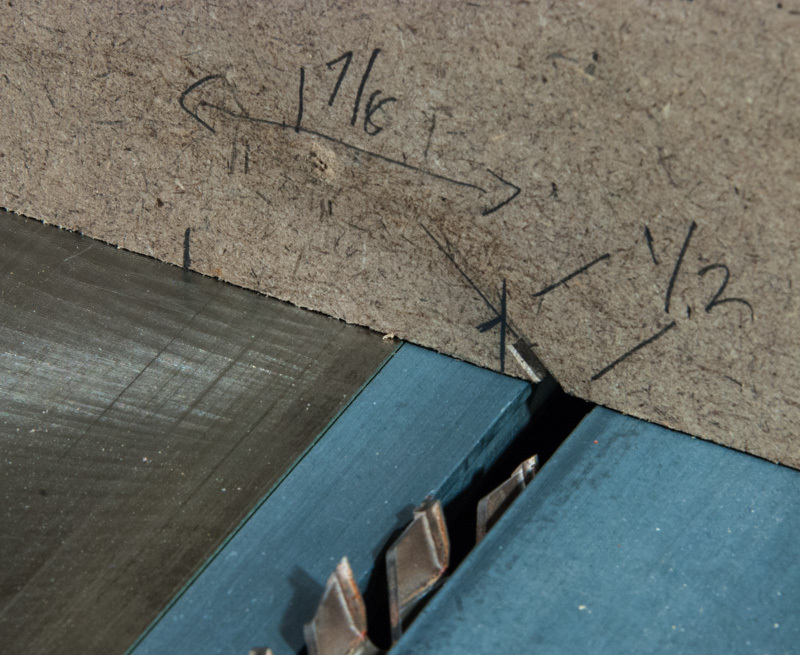 Figure #21: The layout of the miter gauge face piece to cut the V-notches in the jaws. 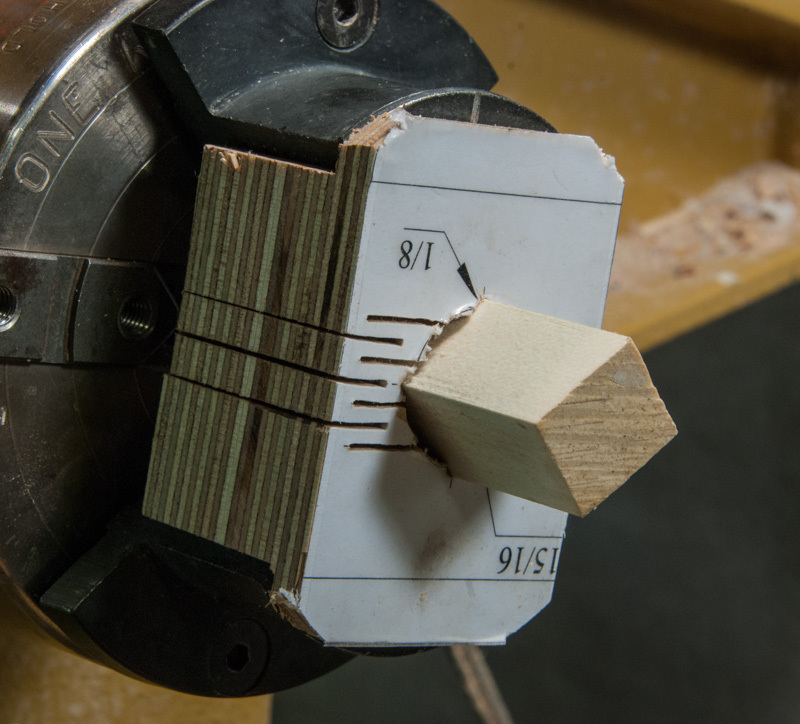 Clamp a stop block to the miter gauge face piece at the 1-7/8” mark. Put a test piece against the face piece and stop block and cut. Turn the piece around and make another cut. If needed, adjust the position of the stop block and try with another test piece until the cuts meet at a nice V point as in Figure #22. Then cut the v-notches in the chuck jaws as in Figure #23. Figure #22: Cut test pieces and adjust the stop block until you get a nice V-notch. Figure #23: Cut V-notches in the chuck jaws. 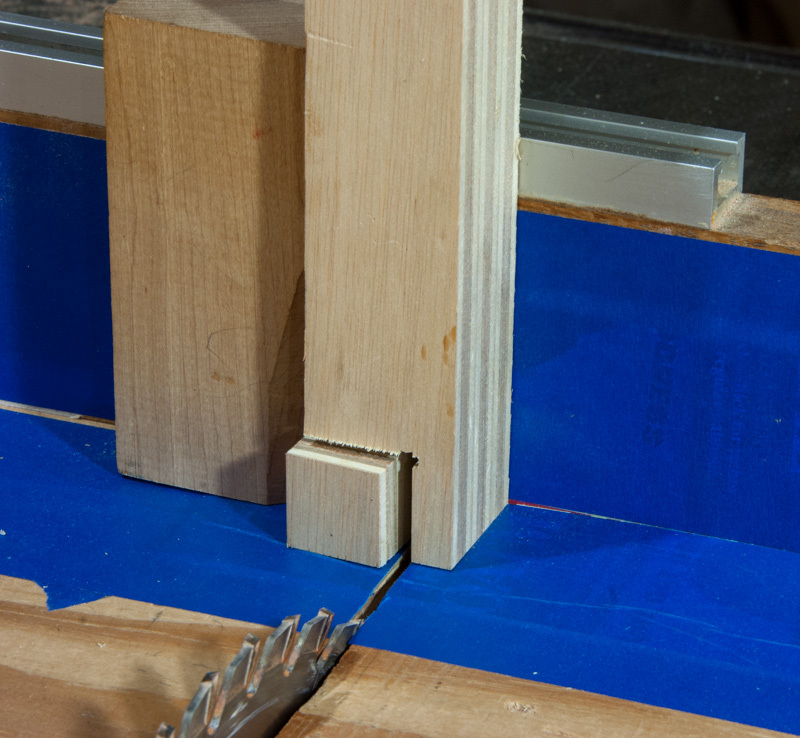 Cut two dowels to 2-1/8” long and bevel one end of each dowel to make it easier to assemble the chuck jaws. Hold the jaws together as they will be in use. Mark one hole on the top jaw and the opposite hole on the bottom jaw. Glue the un-beveled end of the dowel into the marked hole on each jaw as in Figure #24. Quickly, before the glue sets, make sure that the dowels are in the correct holes so the jaws will fit together with the V-notches together and the rebates on the back. Figure #24: Glue in the guide dowels. After the glue sets apply some wax to the dowels and holes. You may need to enlarge the holes with a slightly larger drill (don’t forget the letter drills). Then assemble the chuck. Turn a test piece about 3/4” in diameter and about 1-3/4” long between centers. Trim the end so that the dimple from the tailstock center is small. Mount the tower jaws at the #2 and #4 locations. Make a mark in the middle of the face of the #4 jaw (the one with the jaw opening limit pin) with a triangle file. You’ll use this line as a reference for centering and setting the eccentricity of the chuck. Now mount the sliding eccentric chuck and test piece, while ensuring that the chuck bears on the faces of the tower jaws as in Figure #25. You can use the tailstock center to center the chuck as well as possible. 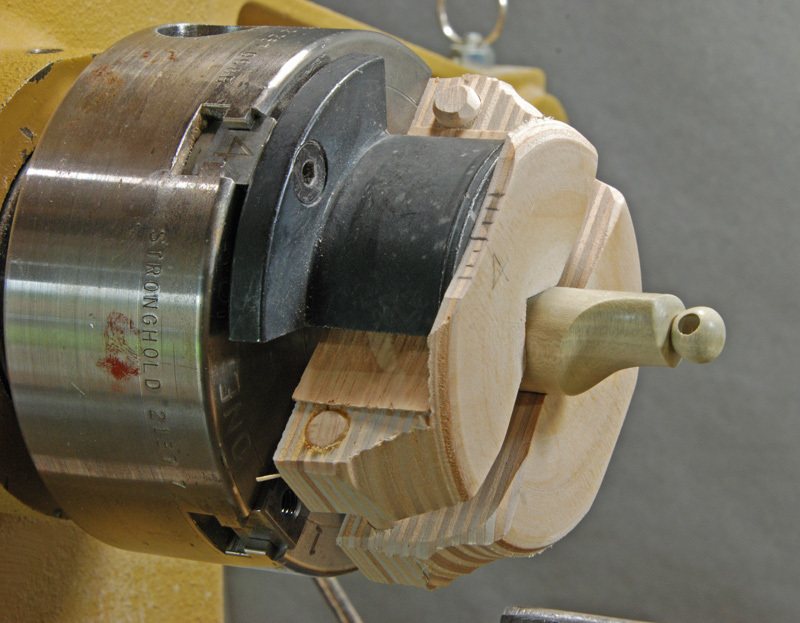 Turn the lathe on and look at the dimple to see how well it’s centered, adjust the chuck if necessary and try again. If you can’t center the dimple there was probably an error in ripping the chuck in half. If necessary, apply veneer shims to the rebate face as in Figure #26 until the dimple is centered. 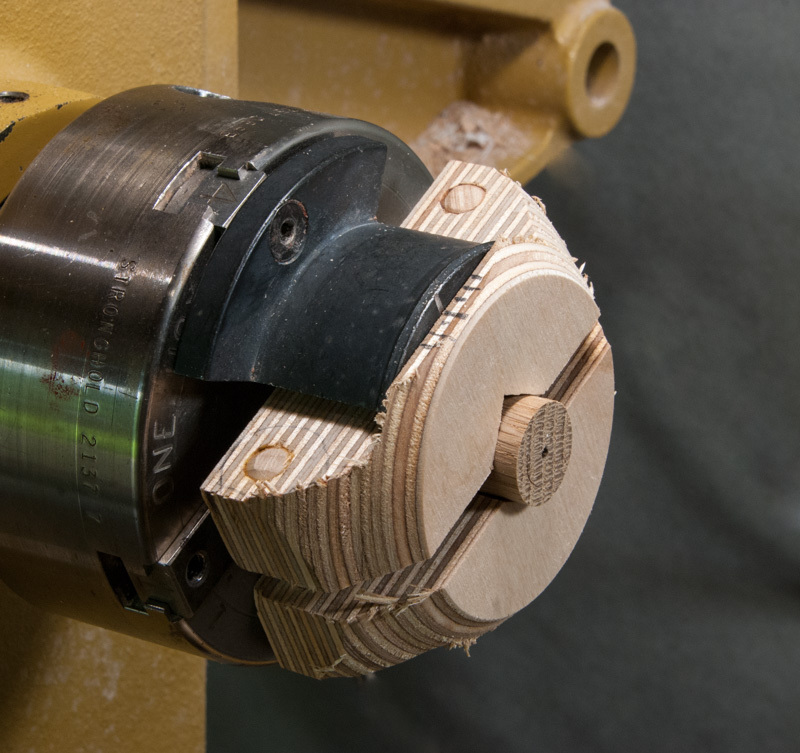 Figure #25: Mount a test piece in the chuck to check centering. 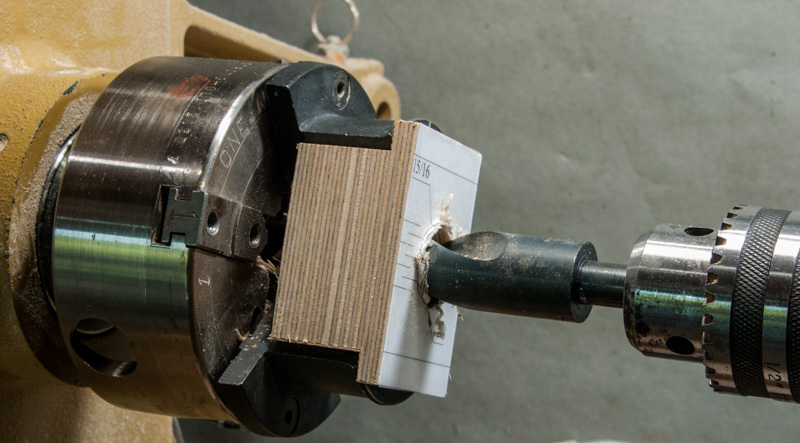 Figure #26: If necessary, use veneer shims on the rebate face of a chuck until you can center the dimple. While the chuck is centered, make a pencil mark on the edge of the chuck aligned with the center mark on the face of the tower jaw. Then make graduated marks on each side of the center mark at 1/8” intervals. Then make the chuck more finger friendly by rounding over the corners as in Figure #27. Be sure not to hit the tower jaws or cut too close to the dowels. Figure #27: Mark the center position and graduated eccentricity positions on the edge of the chuck and round over the corners. This completes the sliding eccentric chuck. Figure #28 shows the chuck from the face. Figure #29 shows the chuck from the bottom, and Figure #30 shows the chuck after turning an eccentric lanyard mounting bail. 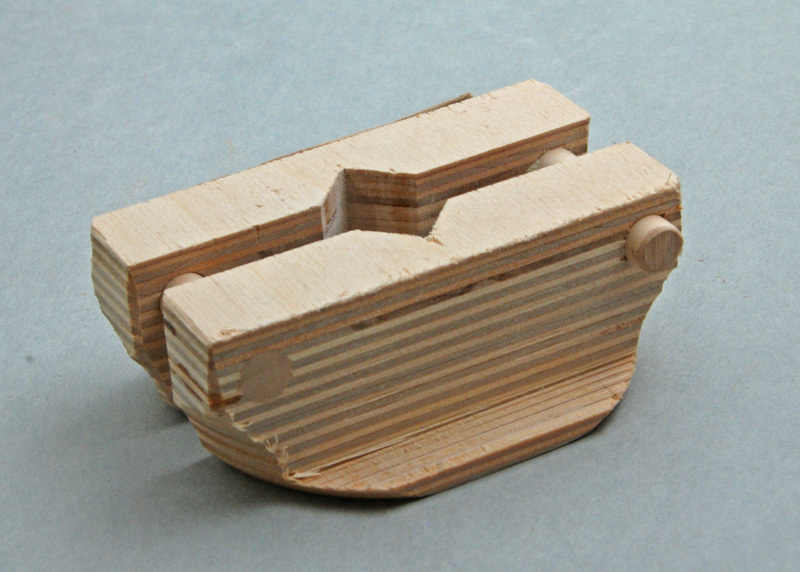 Figure #28: The completed sliding eccentric chuck from the front. 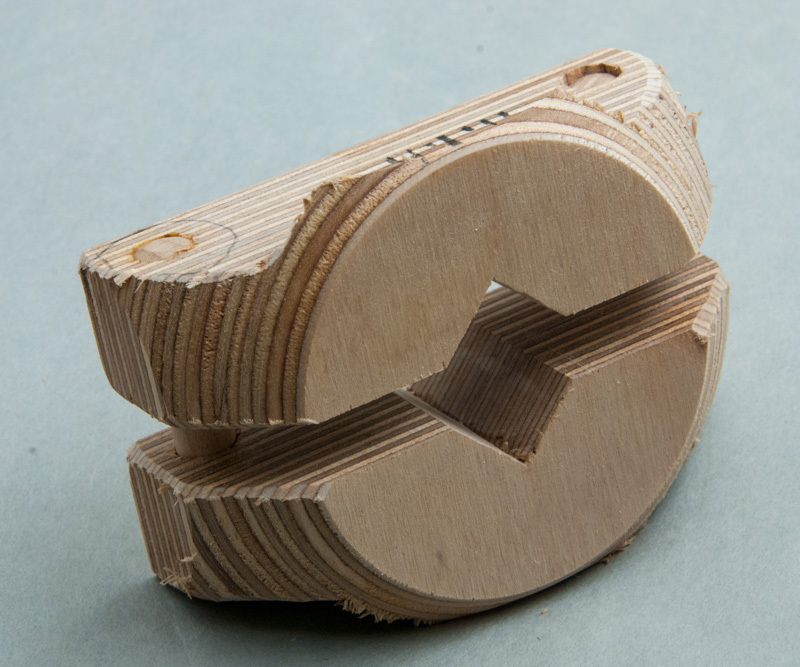 Figure #29: The completed sliding eccentric chuck from the bottom back. Figure #30: A whistle mounted in the sliding eccentric chuck after turning an eccentric lanyard bail. The sliding collet, like the sliding eccentric chuck, can be set to any amount of eccentricity in its range. However, like all collets, the range of sizes it can hold is limited. The pattern is for 3/4” square stock but you could scale it up or down as required. In the past I’ve found it difficult to make deep collets to accurately hold square stock as interior cuts are required and scroll saws often bow out when cutting thick stock. The sliding collet represents a solution to that problem as square stock is held at the corners by drilling four small holes. And after all, I had to try it to see if the idea would work. I did use a spiral blade (which cuts a thick kerf) to cut the inside cuts but you could substitute a hacksaw or hand held scroll saw. Begin by gluing up two layers of nominally 3/4” birch plywood. 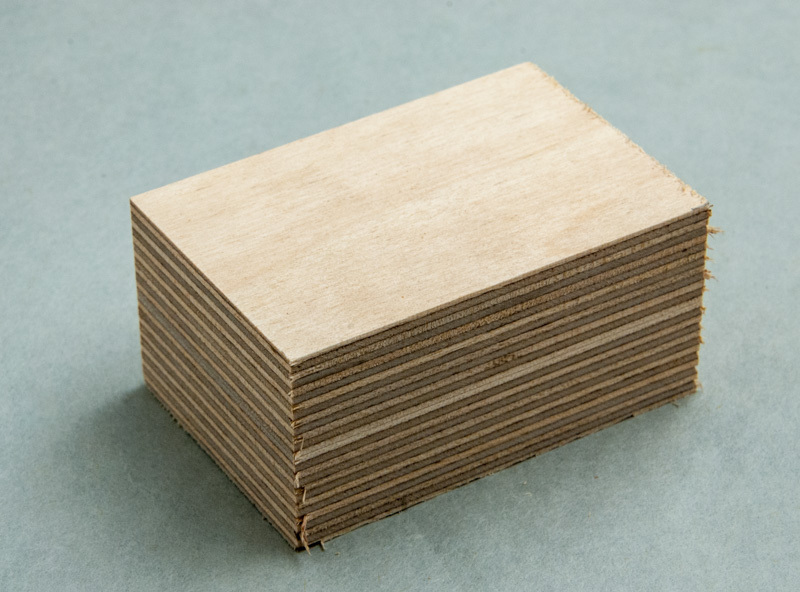 After the glue cures, cut a 2” x 3” blank on the table saw as in Figure #31. Then cut a 3/8” wide rebate as slightly less in depth than your #2 tower jaws as in Figure #32 in the same fashion as the sliding eccentric chuck. Figure #31: The sliding collet blank. Figure #32: Cut rebates on each end of the blank. Download and print out Drawing A and cut it out. Spray the back of the pattern with 3M #77 spray adhesive. While the adhesive is drying cut a piece of waxed paper and fold it in half. Once you’ve waited the time specified on the spray can, place the folded edge of the wax paper about 1/4” from a long edge of the pattern. Place the pattern on the blank (touch down on the wax paper covered part) and align it carefully. Then press down on the strip not covered by the waxed paper as in Figure #33. Gradually remove the waxed paper by pulling on the bottom end of the waxed paper (next to the blank, not the pattern) smoothing and pressing down the pattern as you go. I covered the pattern with clear tape because I habitually do this with templates (of which I’d just made several). This turned out to not be a good idea as the drill bits frayed rather than cut the tape. 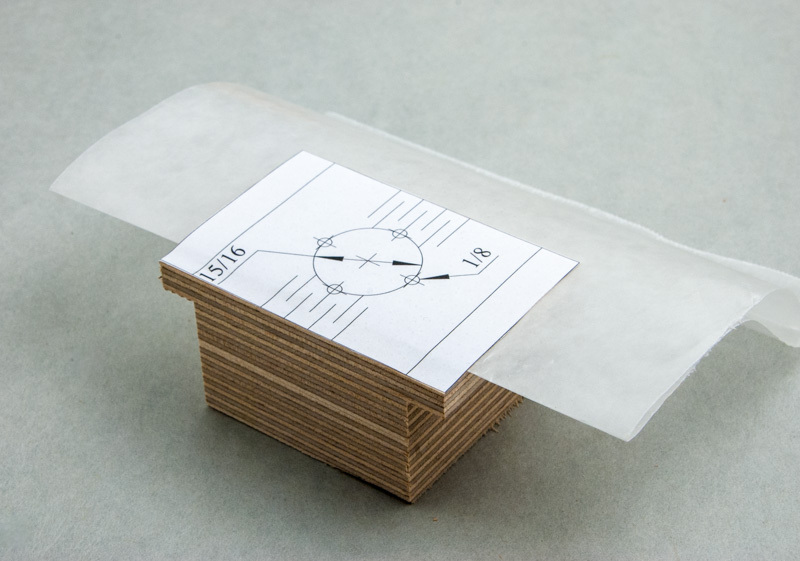 Figure #33: Align the pattern with the aid of folded waxed paper. 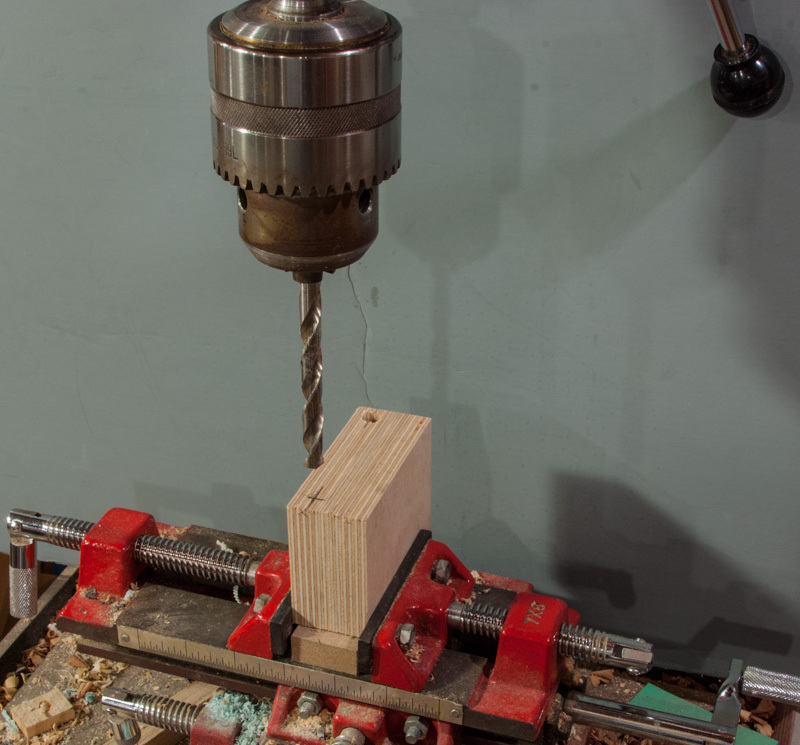 Mount the blank on your drill press with scrap wood underneath. Drill 1/8” holes at the four places marked as in Figure #34. Using a brad point bit (or a center punch) and regularly withdrawing the drill bit to clear chips will help drill straight holes. 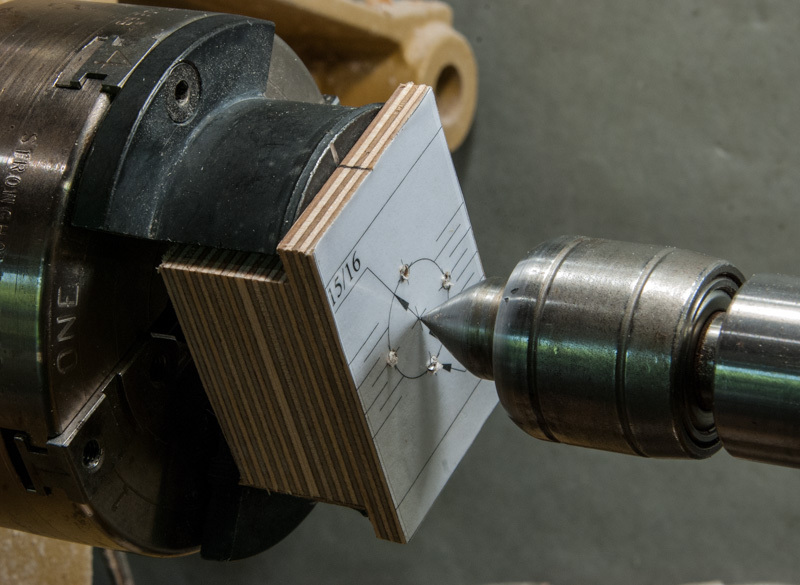 Figure #34: Drill 1/8” holes in the blank at the four marked locations. Mount #2 tower jaws at the 2 and 4 locations. Use a triangular file to mark the center of the face of the #4 tower jaw. Then mount the sliding collet between the jaws and use a cone tailstock center to center the blank as in Figure #35. Make a mark on the edge of the sliding collet corresponding to the mark on the jaw face, and graduated marks at 1/8” intervals for 3/8” on either side. Figure #35: Use a cone tailstock center to center the sliding collet. Mount a combined drill and countersink in your tailstock and use it to start a true hole as in Figure #36. Then mount a 15/16” drill bit and drill a through hole as in Figure #37. 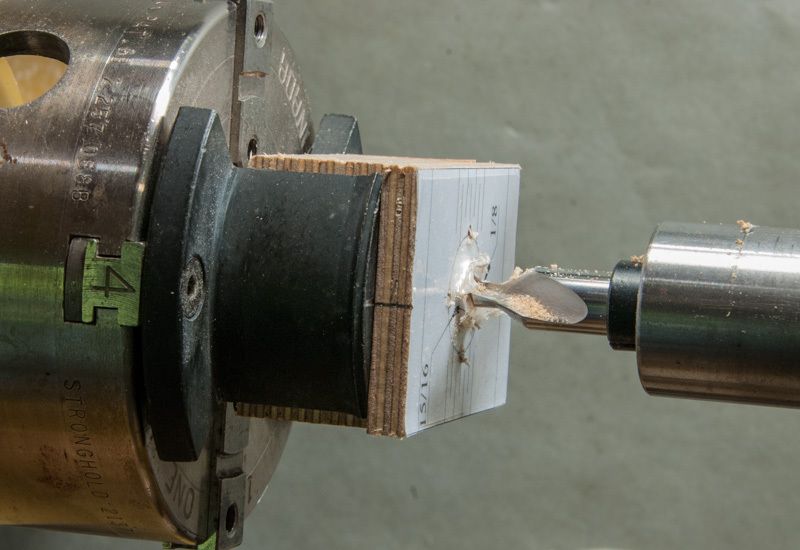 Figure #36: Use a combined drill and countersink to start a centered hole. Figure #37: Drill a through hole with a 15/16” bit. Remove the blank from the chuck. 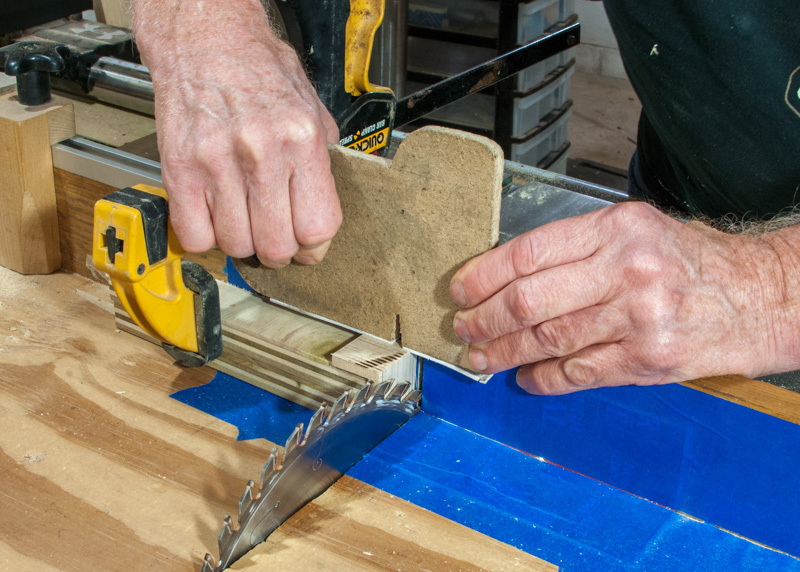 Use a spiral blade (which cuts a wider kerf) on your scroll saw and cut the inside slots as in Figure #38. If you don’t have a scroll saw you could mount the blank in a vise and use either a hand held scroll saw or a hacksaw to cut the slots. 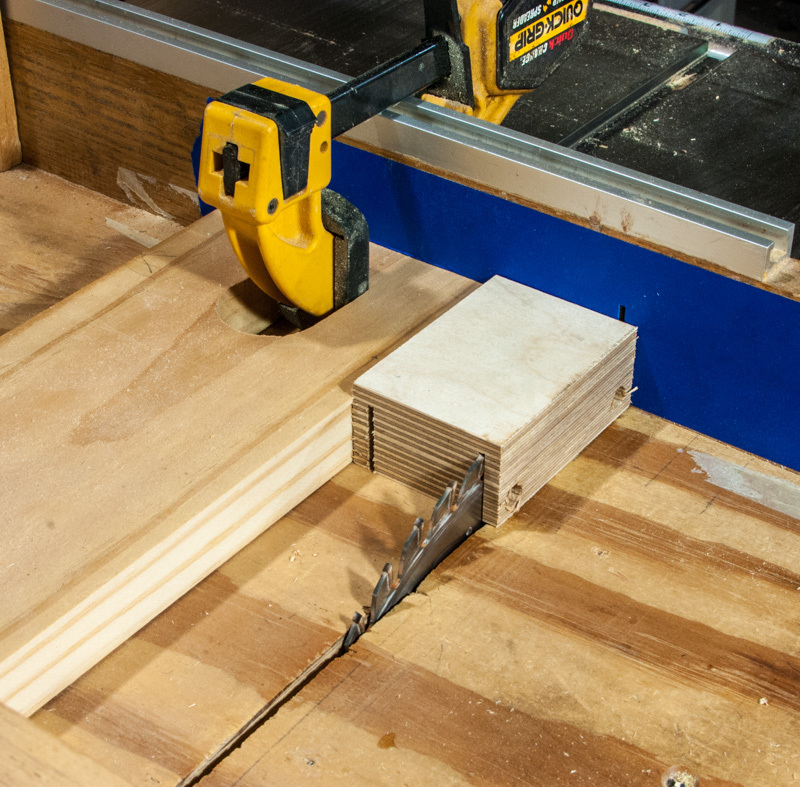 Then cut the outside slots on a bandsaw. 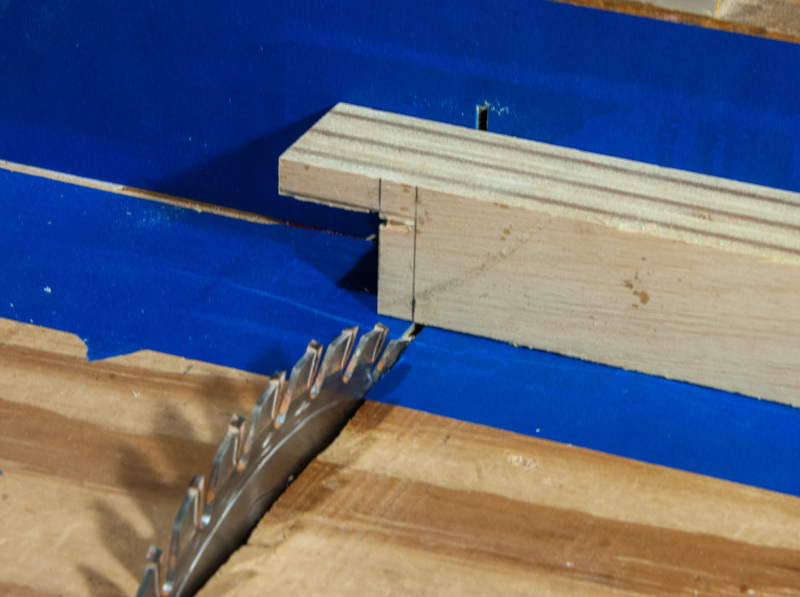 Figure #38: Cut the inside slots with a spiral blade on a scroll saw. Figure #39 shows the now completed sliding collet. Figure #40 shows the sliding collet mounting 3/4” square stock. Figure #41 shows the sliding collet mounting 3/4” round stock with the aid of a PVC sleeve. As with all the other chucking methods shown, when using the sliding collet limit the projection of the stock to what’s needed and use tailstock support as long as possible. Figure #39: The completed sliding collet. Figure #40: Square stock mounted in the sliding collet. Figure #41: Round stock mounted in the sliding collet with the aid of a PVC sleeve.